It's smaller than a grain of rice, yellowish, trapped in amber and lived 100 million years ago alongside dinosaurs. Meet Electrokoenenia yaksha, a newly described type of microwhip scorpion, or palpigrade, from Myanmar, whose minute fossilised remains have been found, trapped in Burmese amber. It has been described by an international team led by Michael S. Engel of the University of Kansas and the American Museum of Natural History in the US and Diying Huang of the Nanjing Institute of Geology and Palaeontology in the People's Republic of China in Springer's journal The Science of Nature. Despite the name, the microwhip scorpion is only distantly related to true scorpions. 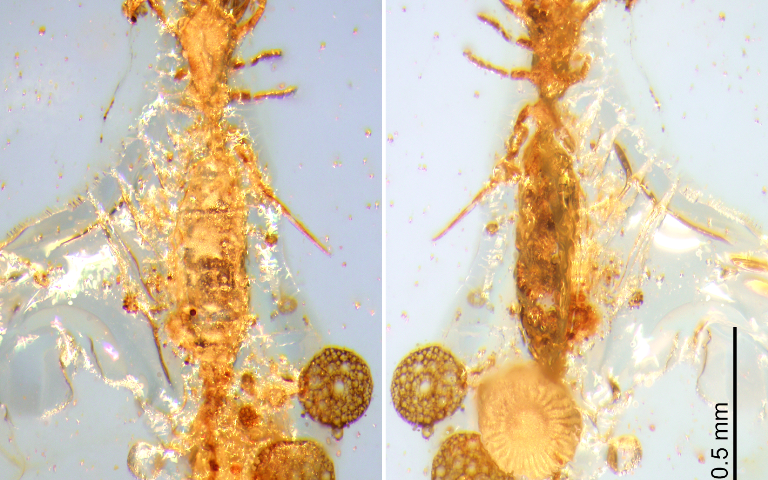 Engel discovered a single example of Electrokoenenia yaksha while investigating the diversity of arthropods preserved in pieces of Burmese amber from the Hukawng Valley in northern Myanmar. These are kept in the Nanjing Institute of Geology and Paleontology of the Chinese Academy of Sciences. Many of the finer details commonly used to compare fossilised remains with those of living microwhip scorpions are not visible in the sample. This is because it is contained in amber and it is obscured by microscopic fractures and debris. Nonetheless, the researchers believe the sample to be that of a yellowish female of 1.47 millimetres long that lived some 100 million years ago during the Mesozoic period. It is the first microwhip scorpion fossil from this period to be found, and also the only one of its order known of to be contained in amber. The only other fossil record from this order is encased in limestone from the Onyx Marble Formation, and is therefore in geological terms between 94 and 97 million years younger than Electrokoenenia yaksha. Because it looks so similar to other microwhip scorpions still found today, it most probably shared the same habitat and preferences as its modern-day kin. The fossilised microwhip scorpion's name is partly derived from electrum, which means "amber." The research team further acknowledged that the fossil was found resting in Burmese amber by naming it after "yaksha." These nature spirits in South Asian mythology are said to have held stewardship over the wonders hidden in the earth. It is hoped that similar examples might yet be discovered to further the study of these tiny, soft-bodied arthropods in more detail. Because of their minute size, they are easily overlooked, particularly if placed near other fossilised items, debris, or when situated among fissures in the material it is trapped in. In the case of Electrokoenenia yaksha, it was initially overlooked owing to its placement among a series of reflective fractures, and appeared to be a slightly darker, thick area. It was discovered upon more careful examination. "Preservation in amber is perhaps the only medium through which such minute animals could be adequately characterized, their fine features and fragile forms too readily destroyed or rendered unidentifiable in sediments," says Engel. He believes that further specimens might be discovered in amber deposits from India, the Dominican Republic, Lebanon, eastern North America and Archingeay in France.